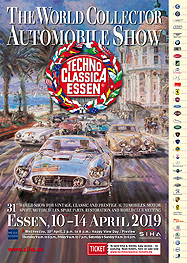 From 10th until 14th April 2019 with the Techno-Classica Essen the S.I.H.A. organises the classic fair with the greatest success and most visitors of the world for the 30th time. Organised as first great German car-salon for vintage-cars, connoisseurs- and collector’s-vehicles in February 1989 it was, and is, an often copied, but never reached, example for a lot of other events of this type. With constant model up-keeping measures it has kept its pioneer role and even still extended – and, nevertheless, remained the unique original. Its recipe for success: To present to the visitors always the newest of the international scene as selection of the best from all fields of the classic hobby. 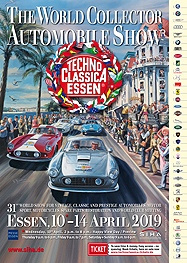 With more than 1,250 exhibitors from more than 30 nations the Techno-Classica Essen reinforces at the 31sh edition its significance as number 1 of the international vintage-car and collector’s vehicles fairs again and provides a comprehensive image of the international classic scene. Also the most important international car manufacturers use the power of ray of the automobile world leading fair: They present selected exhibits, which are to see at their plant stands at a large part at the Techno-Classica Essen exclusively. Car Manufacturers make the automobile world leading fair to the greatest history platform of the international car industry and demonstrate with their mostly spectacular appearances, which importance they attach to the classic world fair. The classic enthusiasts appreciative the commitment of the industry in interaction with the other attraction of the Techno-Classica Essen: 2017 more than 188,000 visitors from more than 40 nations flocked into the full occupied 20 exhibition halls at the Essen Gruga-park. And also the exhibitors know: At the Techno-Classica Essen they play in the Champions League. Also for beginners in the classic scene the Techno-Classica Essen provides attractive offers: More than 30 percent of the automobiles, offered for purchase, are within means “plug and play“-young-timer. The overall more than 2,700 offered classic-, collector’s- and connoisseur-vehicles, young-timers and prestige cars make the Techno-Classica also in spring 2019 to the greatest classic market of the world again – here the Crème de la Crème of the international classic dealers come together with offerers of use-classics and private sellers. The last are to find at the four open spaces above all. For the more than 200 exhibiting classic-clubs and communities of interest the Techno-Classica Essen 2019 is regarded annually as the most important classic fair of the year: The honoraries make it to one of the greatest club meetings of the vintage-car and young-timer scene of the world and reflect the variety of the international vintage-car and classic scene with their commitment. To spur on the clubs for peak ratings, the Techno-Classica Essen also 2019 organizes the Club Grand Prix: A jury of club activists select especially creative designed stands which are honoured with cups and attractive cash prizes for the club cashes. The clubs are one of the significant cornerstones of the classic world fair and provide with their often amazing designed stands exciting infotainment. The club appearances are supplemented by the qualitative and quantitative unattained offers of top-restorers, supplying enterprises, suppliers of car literature, spare part dealers, accessories sellers, clock- and technology dealers, artists and art dealers, publishers, and not at least model car suppliers. Becausethe Techno-Classica Essen is the fair with the greatest profit potential. The consequence: The specialist dealers – as well as also the visitors – are not coming only from entire Europe, but also from overseas. So, among others, exhibitors from North and South America, and in the last years also increasingly from Far East, present their range. With its great part of offerers and visitors from all over the world, the Techno-Classica Essen is the classic fair in Europe, which, in the matter of internationality and global fair, no other classic can hold a candle to. To the traditions, maintained at the Techno-Classica, belongs a Concours d’Elégance, at which an international jury of experts and specialist journalists elect the most beautiful, most elegant and most attractive dealer classics and choose “the Best of Show“. In addition there is a “Club Grand Prix“, at which the most attractive club presentations are honoured with cash prizes for the club cashes. Past and future: At the five-days fair everything, really everything, is offered around the topic vintage-cars and young-timers – so there meet from 10th until 14th April 2019 a lot of VIP’s from movies and TV, stars from the history and present of the motor sport and the most important deciders from the classic scene as well. The attractive and fascinating exhibition spectrum makes the Techno-Classica Essen to the automobile infotainment event of first class for the whole family, to the world exhibition of the car. “The ambitioned beginnings were followed by years of consistent extension up to the label with worldwide respect – today the classic cosmos meets for the start of the season in Essen“, it is called in the prospect of the S.I.H.A. and: “Protect the spirit of the pioneers with us, yesterday – today – tomorrow. Share the passion“.